Because the options are expected to cover a five-year period on an annualised basis, Tyagarajan’s 2018 compensation was $8.3 million. 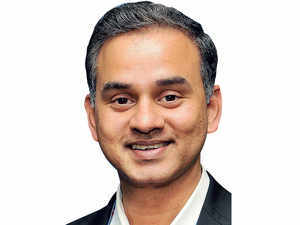 BENGALURU: Genpact CEO NV Tyagarajan’s total annual compensation jumped to over $22 million from $3.1 million the previous year, helped by $17 million in option awards in 2018. “In 2018, our CEO was granted an option covering 2,133,106 common shares. This is a multi-year grant, and we do not expect to grant any additional options to our CEO prior to full vesting of his 2018 option grant,” the business process management company told the US Securities and Exchange Commission in a filing. The company’s chief financial officer Edward Fitzpatrick earned $2.4 million in 2018, marginally lower than the $2.5 million he earned in 2017. Patrick Cogny, senior vice-president, infrastructure, manufacturing & services and high tech, earned $1.96 million in 2018, and Arvinder Singh, senior vice-president of capital markets and IT services, earned $1.97 million. The company also disclosed that as of October 2018, it had about 7,000 employees in the United States, out of about 83,000 employees worldwide.